The bones are divided into 5 groups: “Control” (green), “IK” (yellow), “Volume” (bright red), “Attachment” (dark red), and “SL” (blue). Not all bones are visible by default. The display would otherwise become close to useless (see image to the right). 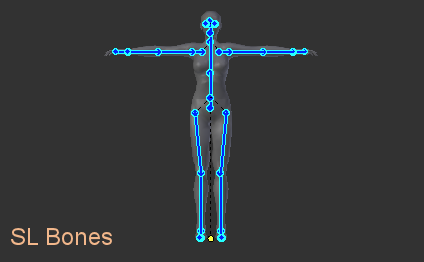 We have chosen the default to display only those bones which are most relevant for animation. A detailed description on what the Avastar rig is based can be found in the supplemental document “The OpenSim Skeleton“. These are control bones for the usual SL bones (see below). These bones are used for posing and animating. They are very similar to the SL Bones but come with a small tweak: the Pelvis bone has been flipped around and made a child of the COG bone so that it’s easier to animate hip movement. Otherwise the sizes and parenting hierachy is the same as in SL. By default we have enabled “Custom Shapes”. 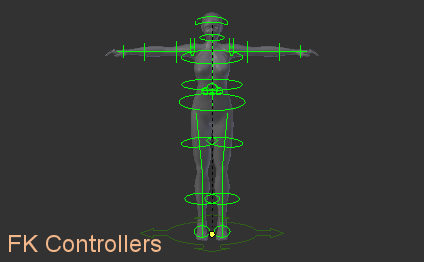 that is the bones are not displayed as bones, but as control handles (green rings around the Avastar Mesh Character). To see the bones in a more traditional form tick “X-Ray” and untick “Shapes” in the armature tab of the property editor. 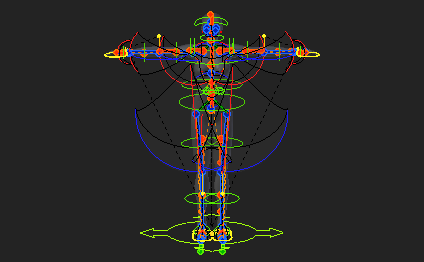 Note that there is a few more bones than you might expect as some of the bones are there to support the structure of the rig (some are hidden on a particular Armature layer – see the Armature tab of the Property Editor). Extra – some less used controlling bones (Foot, Toe, Skull, and Eye bones). Note that the eye bones are used indirectly for animation via the eye control bone. These bones belong to the IK (Inverse Kinematics) system. By default these bones are invisible and the influence of these bones is set to zero. To enable IK control select a bone on a limb and use the sliders in the “Rig Properties” section of the Properties Panel. When switched on the whole limb will try and align with the position of the IK control. Note that there are a bunch of bones that are there to provide a target for the IK system and to show you how a limb is orientated. The latter bones can be made visible with the “IK Rig” visibility switch below. These are the “true” bones of the SL Character. These bones are used to do the weighting for your own mesh characters or mesh attachments. When it comes to export of your mesh, then (by default) this is the only set of bones which are taken into account. But see for more details in the export options. For animations these are the only bones that count (together with the Origin which provides the reference point for the entire entire avatar). The Origin: This bone is at the feet and is shaped like a four pointed arrow. All the animations are relative to this bone so moving it around won’t change the animation, it just gives you another handle to position the avatar and it represents the floor for the avatar. If you were creating a multiple-avatar animation, think of puting the Origin bones where you would place the pose-balls. The COG Bone (Center Of Gravity Bone): The COG is how you rotate or move the character as a whole. The Pelvis and Torso are children of this bone and everything else is a child of those. Normally this bone is a small green circle near the small of the back. 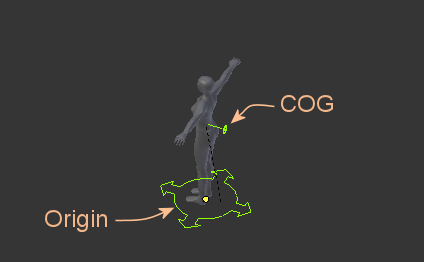 In contrast to the movement of the Origin, any moves or rotations of the COG bone will be recorded in your animation. 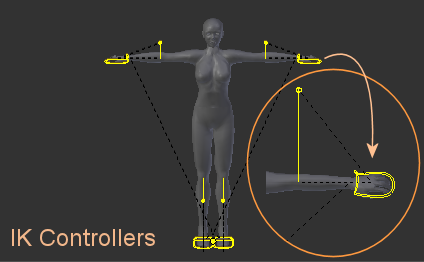 The attachment points correspond to the attachment points of the Avatar. 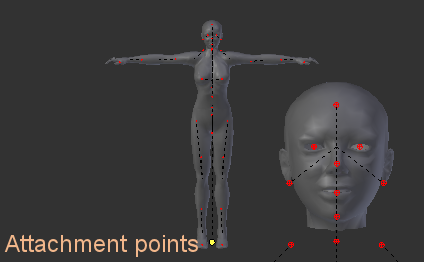 These points are primary used for animation. But we also support weighting of the attachment points. Unfortunately, SL doesn’t appear to support repositioning these bones. Note: Most suported online worlds do not officially support weighting of attachment points. And not all attachment points can (currently) be used for weighting. In particular all attachment points which contain a space in their name (e.g. “L UpperArm”) will not be recognized as”weighted bone” during import to OpenSim or a compatible online world. 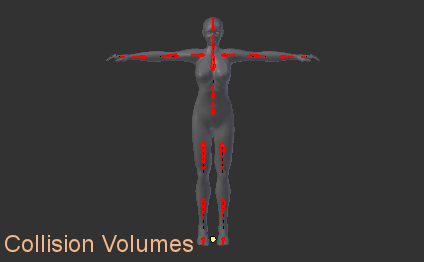 The Collision Volumes correspond to the collision volumes in the Avatar. 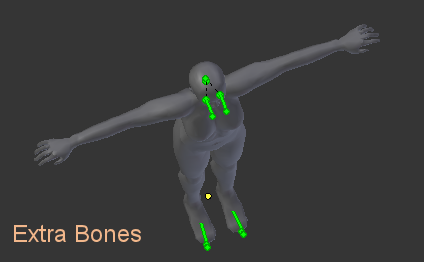 Originally these bones provide a simple mesh frame that allows efficient (fast) calculations of physical interaction (collisions) of your avatar with the environment. However these bones can also be used for animation and weighting. The most important feature of the Collision Volumes is that they are coupled to the SL Shape sliders. And if correctly weighted, they allow your meshes to be customizable via the SL Slider system. Note: This feature is also fully independent(!) from the Mesh deformer project which is currently implemented by Karl Stiefvater in the “Mesh clothing parametric deformer” project. Note: This feature works on all online world viewers which support Mesh. Detailed information about weighting to the Collision volumes will be provided.